Our winners! We’re so proud of our boys this year. Not only did they do most of the work (really! 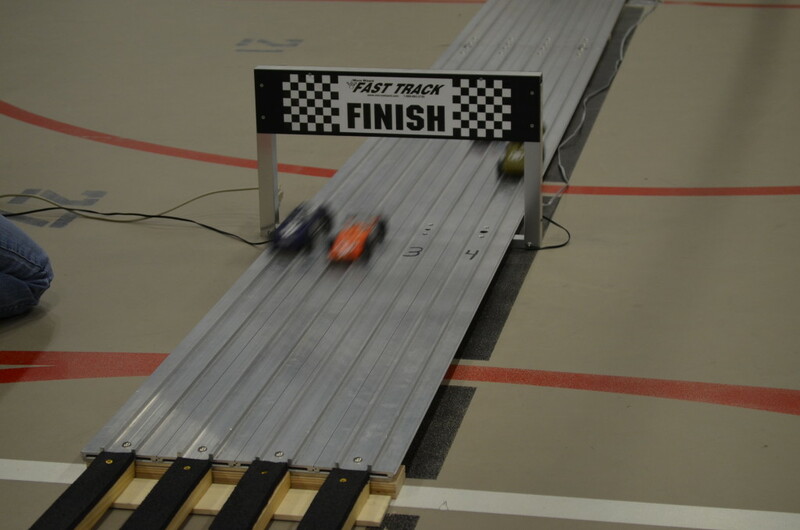 ), their cars performed very well, earning first place trophies for each of their age groups. 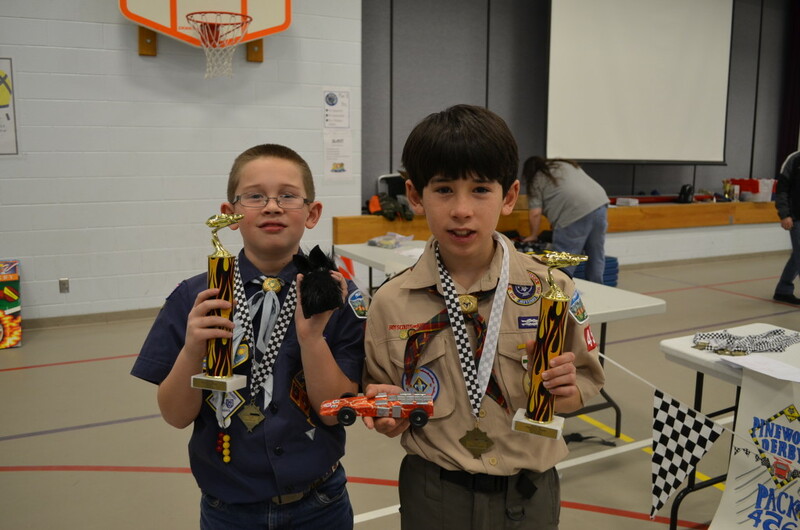 Last month the boys participated in their Cub Scout pack’s Pinewood Derby. I thought I had written about our sons’ Cub Scout Pinewood Derbies before, but I guess I hadn’t. This is Jacob’s 5th year competing, and Timmy’s 3rd. And our third Cub Scout pack experience with it. Because this is a much smaller pack than we had in Florida, the entire event was completed in less than two hours. It was nice to see the boys pay attention to the entire event…unlike in Florida where the event was around 4 hours long. 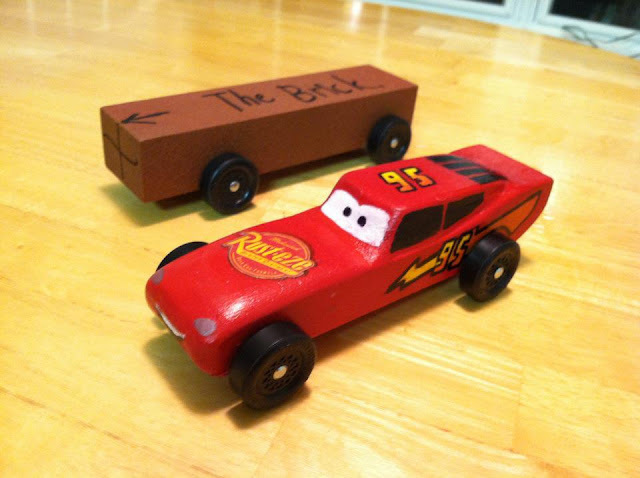 I’m going to discuss the cars our sons chose to make, and then discuss the event itself. I guess I’ll be spilling some trade secrets and monetary investments we made in the boys’ cars, but I don’t think what we did was too unreasonable. 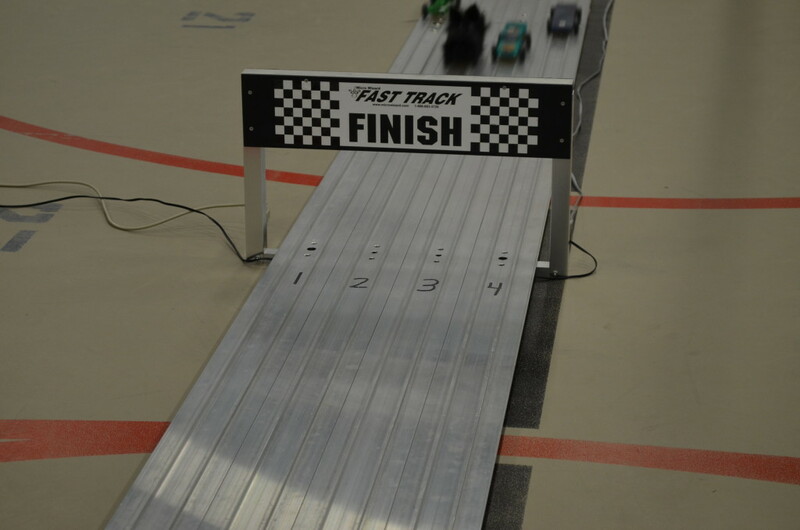 This was Jacob’s last Pinewood Derby (sniff, sniff), for he will be crossing over to Boy Scouts at the end of February. We are very proud of Jacob’s work. He looked on the Internet for “fast car” ideas and saw most of the winning cars were wedge-designs. Jacob sketched his block of wood into a low wedge, and Dave helped Jacob make the cut with our miter saw. Jacob then did the sanding, and applied this “skin” to the exterior instead of painting it. I helped Jacob use this diamond-putty kit to polish the wheels and axles. This is the first year we used this product, which is about $10 at our local hobby store. It’s worth it. We had plenty of putty to polish both boys’ cars’ axles and we’ll see if we can break it out again next year for Timmy’s car. Using our kitchen scale as a guide, Jacob used peel-and-stick weights to get it as close to 5 ounces (the legal limit) as possible. At first his plan was to sink all of the weights into the bottom of the car, but he got tired of removing wood weight so he elected to just stick them all over the sides and top. Like Jacob’s favorite plane, the A-10, form follows function. 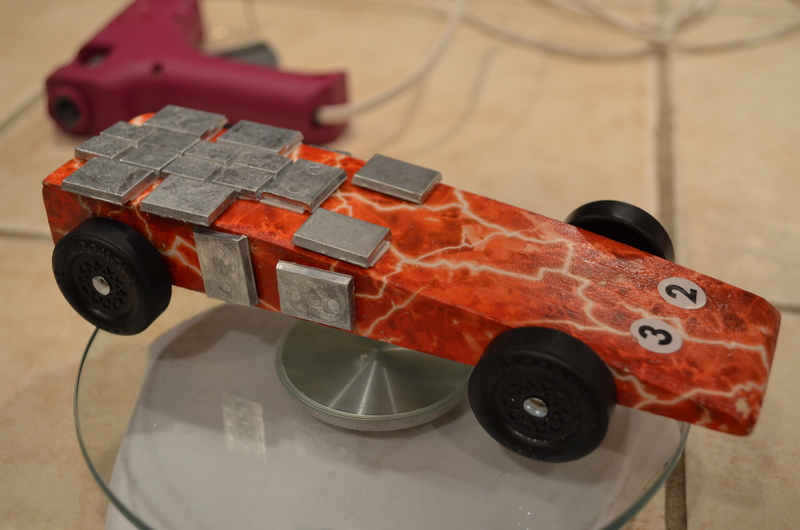 Jacob’s completed Pinewood Derby car, “The Electric Wedge”. Timmy always opts for the more creative cars, from his award-winning 2012 Lightning McQueen to his 2013 iPhone Car. This year he requested a Howie car. As in, our dog. Timmy’s first set of brainstorms included attaching legs and a complete tail, but Dave and I persuaded him to opt for something more simple, such as just his head. We discussed materials. I offered to visit our local hobby store for some black felt with which we could cover the car, and then cut out a couple of ears. I went to the Hobby Lobby store up the street and was tickled pink to find small sheets of faux fur. It wasn’t expensive at all (less than $2 with my coupon) and was perfect for Howie’s head! Timmy was charged with using his new pocket knife to trim his rectangular block into more of a triangular shape to better represent Howie’s head. He didn’t have to be precise, since the fur would cover up any imperfections. No, he wasn’t precise at all. I don’t have any pictures of the block of wood after Timmy got a hold of it…but it sufficed for our purposes. 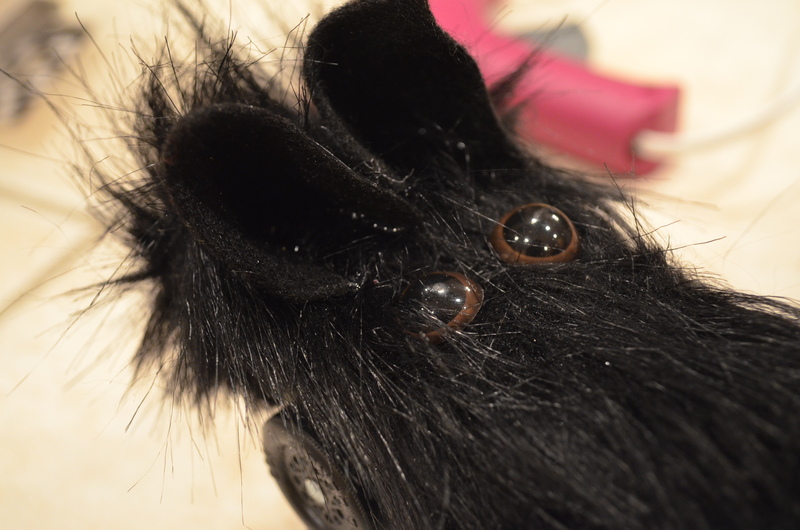 With a hot glue gun, I carefully attached the panel of fur and glued on two felt ears. Dave drilled two eyes (which can also be found at the hobby store) for a finished replica of Howie’s head. Most of the weights were applied to the bare wood before we attached the fur. We then fine-tuned it after everything was attached. A close up of the details. Felt ears and “doll eyes” that I picked up at Hobby Lobby. The finished Howie car. It weighed in perfectly! 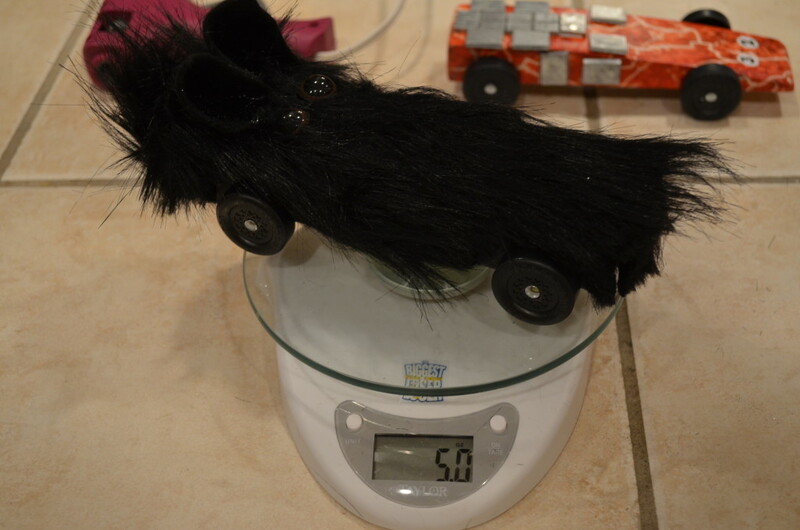 However, I was worried about the fur getting tangled in the axles. Thankfully it didn’t happen. I am SHOCKED at how well Timmy’s car performed. Timmy understood that the physics of having a fur-covered car wasn’t going to be the same as a smooth car. We made it clear to him that it might go slow…or fur might get caught in the axles and stop the car in its tracks! But we did point out to him that according to Wired Science, in the short distances of a Pinewood Derby track, neither the aerodynamics of the car surface nor the weight of the car have as much influence as minimizing friction. So that was our focus for speed, minimizing the friction — like Jacob’s car, we used the diamond putty polish to remove as many imperfections as possible from the axles and wheels. Both boys earned first place for their respective dens, but others in their dens placed in the pack and would advance to the higher-level races. Jacob’s car in red taking first place in this particular heat. Each car participated in eight heats. Timmy’s car is coming in first place in this heat. We shocked everyone with how fast his car went. This is our family’s 5th year being involved in Pinewood Derbies. This is the first year we took time to polish the axles and wheels. Wow! What a difference it made.